The Texas-based wristband manufacturer is a renowned name in the wristband industry. Customized wristbands in supreme quality and quick delivery services are some of the traits of Make Your Wristbands that make it a customer-favorite company. The company delivers its non-allergic products to you as soon as possible. Rush production takes around 6 days. You can also get your personalized accessories in just a few days after contacting its staff. On the company’s official website, you can design your own wristbands. From choosing the product, its color, and message style to font color, you can decide almost everything for your rubber bracelet. In addition to a message, you can also engrave a clip-art on these accessories to give them a unique appearance. Its services come with ‘no minimum order’ flexibility. Apart from that, if you have any special instructions for the company to follow while designing your wristband, then you can directly contact its customer support team. Whether you want debossed, embossed, screen-printed, ink-filled, or any other type of customized wristbands without spending a huge amount on them, Wristbandbuddy is the right place to contact. On their official website, you can design wristbands in a way you want them to be. In addition to inexpensive prices, the company gives you free wristbands under a few circumstances. Online store of the company features different types of silicone wristbands that are available for customization. Their customer support services are also there to assist you whenever required. If you have a big order of personalized wristbands, then you should choose the company over others for customization. You will surely get plenty of free wristbands to cover more ground of your objective. It is another company online where you can get high-quality silicone bracelets. Based in Texas, the company has an online store where you can customize various types of colorful rubber bracelets. Apart from silicone bracelets, Amazing Wristbands offers various other products for customization. For example, you can get key chains, USB, and other items with a special message engraved on them. The company’s products are produced in China and take around 12 days to deliver them to customers. 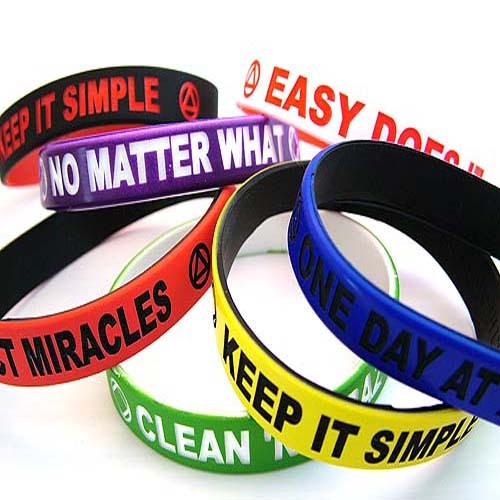 Like any other wristband manufacturer online, Top Wristband features many rubber bracelet styles. From blank and debossed/embossed to dual layer, the store has all available for customization. You can design them on the service provider’s official website. Here, you can select the bracelet type, its color, message font, and various other things that you may require to adjust while making your own wristband. Top Wristband also deals in lanyards. On the same platform, you can pick any lanyard style, size, color, attachment, and various other materials needed. On the lanyards, you can engrave a text to provide it a personal touch. Founded more than a decade ago, 24 Hour Wristbands has many types of promotional products available for customization. From wristbands, apparels, mugs, hand fans, ceramic mugs, key chains, and vinyl banners to pens, the online store has many items that you can personalize to meet your objectives. When it is about customizing silicone wristbands, there are many options to choose from. In addition to picking the right type and color, you can also decide the font of text that you want to engrave on rubber bracelets. While exploring the World Wide Web in search of personalized silicone bracelets, you will find many online companies. But these five are the best in the business due to their high-quality products and quick delivery services. Choose them to customize the right products and let them serve their purpose.